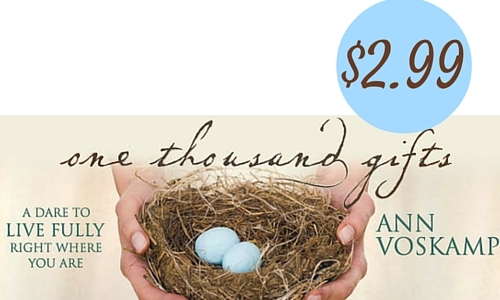 Right now on Amazon you can get the Kindle version of One Thousand Gifts by Ann Voscamp for $2.99. What a great price for a wonderful book! This book is beautifully written and will give you a great picture of how gratitude allows us to connect intimately with God in everyday circumstances. If you don’t have a Kindle you can download the app to be able to read this book on your tablet or smart phone devices. Don’t miss out on getting it at this great price. Prices can change at anytime on Amazon.